Dog First Aid Franchise Ltd holds first AGM in Bath! If you happened to be paying Bath Cats and Dogs Home a visit on Thursday 26th April you may have noticed a number of people wearing red! This is due to the first annual AGM for the ever growing team of Dog First Aid Franchise Partners being held at the centre on that day and what a great day it was too! Dog First Aid started running courses in 2013 after it’s founder, Jo Middleton recognised that the vast majority of dog professionals didn’t have the invaluable skills needed to be able to administer First Aid to any injured or ill dogs within their care and in 2015 the courses were awarded CPD (Continued Professional Development) accreditation. 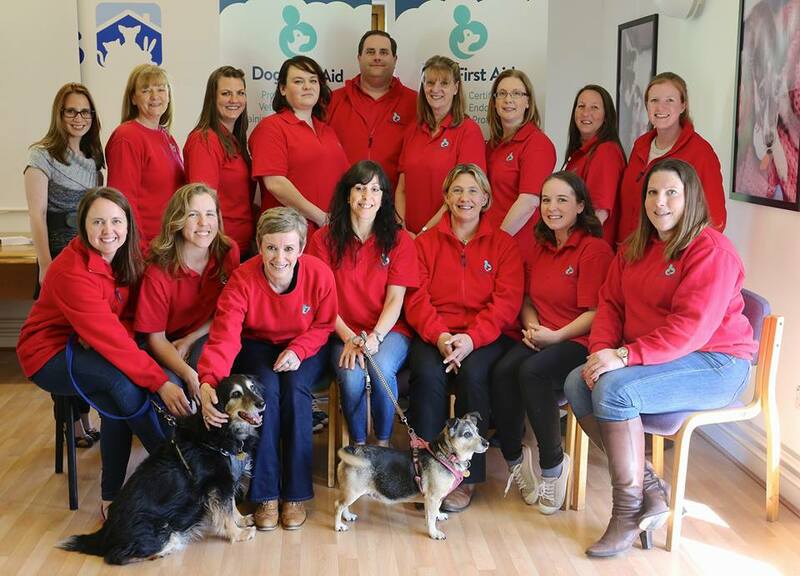 At this time Jo and a small team of veterinary nurses and trainers were running the courses but as the popularity increased the decision was made to Franchise the business so it could cater for the growing demand for courses nationwide. The first Franchise Partner, Hannah Burton RVN A1 came on board in 2016 covering Bristol, Somerset and Dorset and a further two joined in quick succession. Today there are 11 Franchise Partners in total and a number of people in talks to take on territories of their own The AGM marked the first official get together for this dedicated group of dog lovers. The day was filled with talks, idea swapping and laughter. After the initial introductions and house keeping, the talks kicked off with Kieran James from PayKeeper (https://www.paykeeper.co.uk/) who discussed Building a Deliberate Business – The Importance of Performance Measurement. Jo strongly believes in empowering people to develop a healthy work/life balance and has created a strong formula for the running of the Franchise which enables the partners to do just that, so Kieran’s speech was the perfect start. Kieran was followed by Dr Marianne Thomas BVSc MRCVS (http://www.dog-first-aid.com/mariannethomas/) who is the Franchise Partner for Oxford and Bucks and a member of the Royal College of Veterinary Surgeon who did a presentation on dogs and seizures and then Claire Pooles (http://www.dog-first-aid.com/clairepooles/) who, as well as being the Franchise Partner for West Berkshire and Hampshire, is also a qualified Finance Director and she discussed ways to manage the impact of VAT registration on partner profitability. After lunch – supplied by Sainsbury’s in Bath and very much enjoyed by all, Natalie Sherman and her colleague (also called Natalie!) from Wiltshire based, Naturally Social (https://www.naturallysocial.co.uk/) provided an incredibly useful talk on how to effectively use Facebook and Instagram in business. One Franchise Partner commented that she learnt more in that hour’s talk about Facebook than she did from Facebook’s own support in a whole year! The day came to an end with an informative tour of Bath Cats and Dogs home and sociable meal at the Green Rocket Cafe in Bath. The perfect start of what will be many AGMs to come. Dog First Aid are looking for dog lovers all over the country to join their expanding team. If you would like to be your own boss while helping the dog loving community please contact info@dog-first-aid.com to find out how you could be at next year’s AGM! Next PostNext Sing with your bump, baby or toddler in tow!